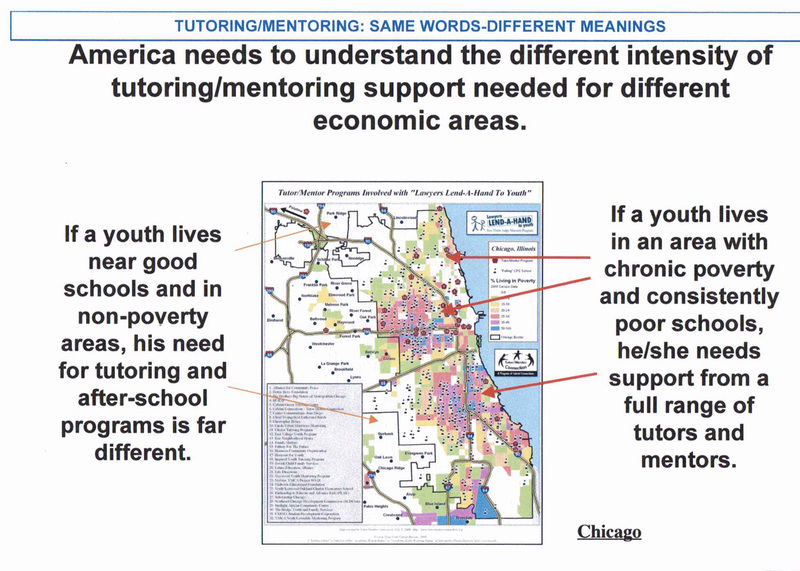 Tutor Mentor Institute, LLC: Focus on Inequality. Using Maps. Last spring I wrote a series of articles following the publication of Robert Putnam's new book "Our Kids: The American Dream in Crisis"
I created the graphic below several years ago to illustrate the inequality of opportunity for kids living in poverty neighborhoods and those who live in more affluent areas. I have piloted uses of maps for nearly 20 years because they focus attention on all of the places with high concentrations of poverty, which are places where kids need extra help offered by organized, long-term, tutoring, mentoring and learning programs. Every big city in the world has areas of concentrated poverty, and consistent neglect. Thus ideas I share could be applied in any city, led by a wide range of different institutions and leaderships. Use the articles on this blog and the Mapping for Justice Blog, and the Tutor/Mentor Institute, LLC site, as resources for on-going learning and innovation that you can apply through your own leadership. I want to help make that happen. I need a few of you to help me do that.